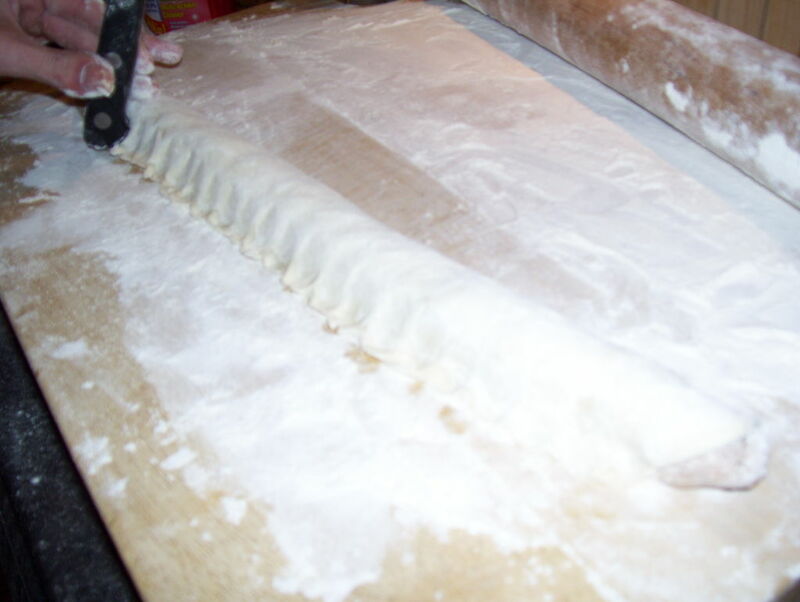 Family Special: Christmas Sausage Rolls. These sausage rolls were a closely guarded secret to friends and family until now, I'm going to show you how to make these delicious christmasy morsels. This recipe has slowly been added to and improved over the years but the basics of it have and will always be the same. As you all know cooking can get messy. Depends down to you really if your tidy or messy but before cooking be sure to clean your kitchen as we don't want anyone getting ill, Do we! I'll also give you a suggestion for the perfect Christmas breakfast of which we have every day from Christmas day will into the new year, find this at the bottom the this Instructable. As I will have to add it later. 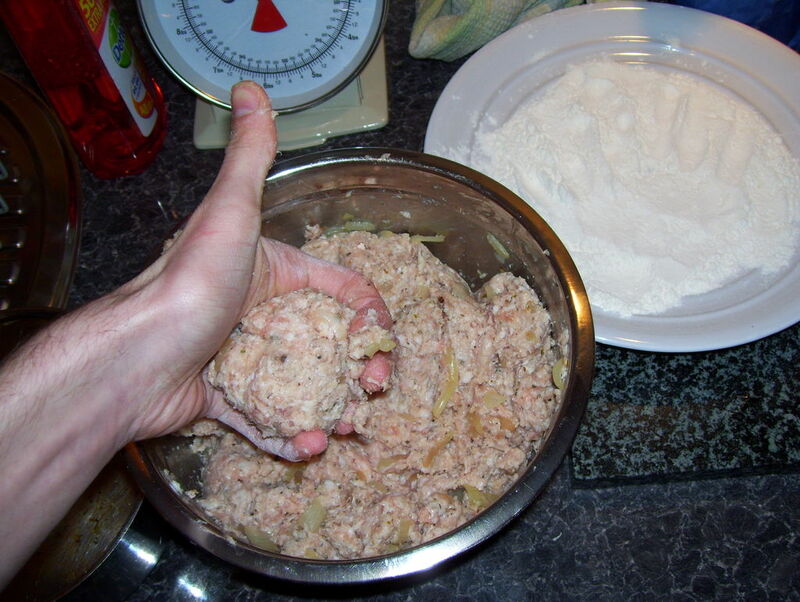 Make sure you have least 4 hours on your hands if your doing a big batch. So are you ready? Lets look at what we need! Step 2: What Were Going to Need. 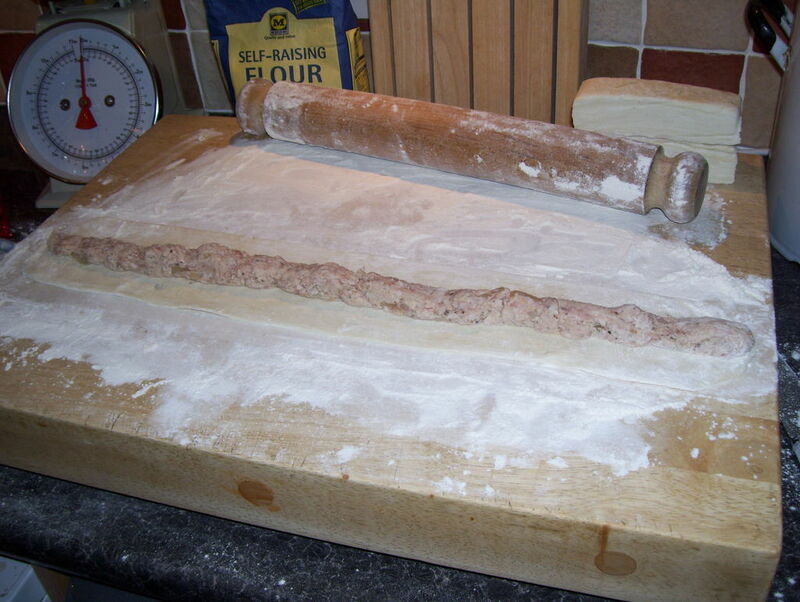 I'm going to base this around the big batch that I do (Around 200-300 sausage rolls) Which compared the size of these sausage rolls is enough to last right through the Christmas period but If you will require a smaller batch divide the ingredients as needed. 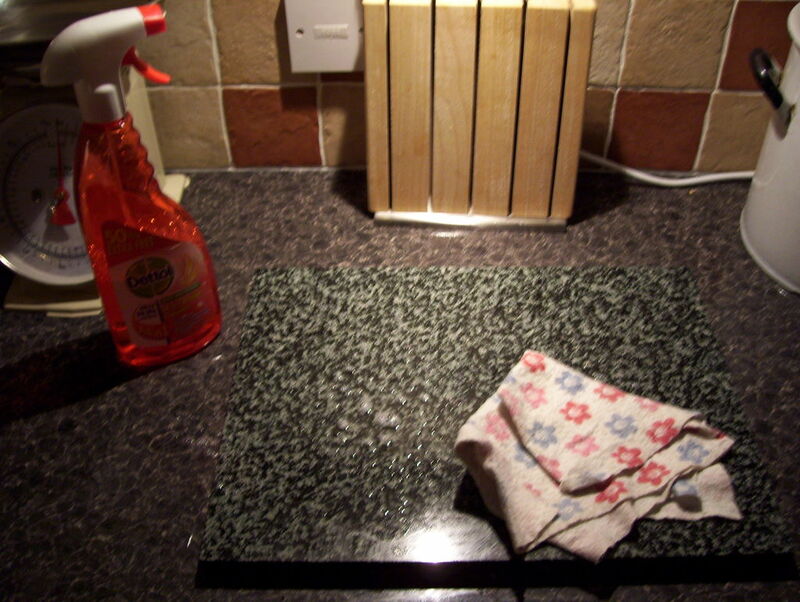 First part of anything will be the cleaning so scrub up, use anti bacteria spray on the work areas. 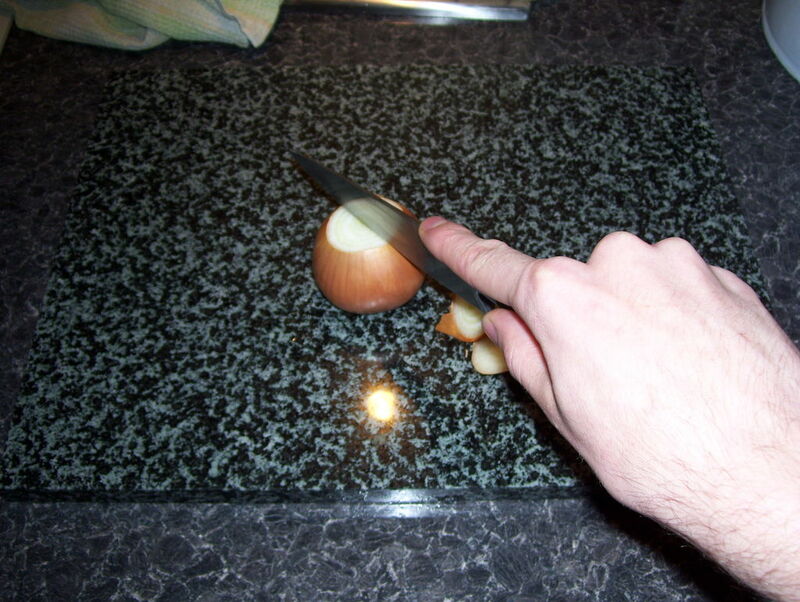 Peel and chop your onion into a fine-ish dice. The way I cut my onions is to top and tail them (Cut off the top and bottom), Sit it on one of the ends and slice it in half, Now just peel off the skin and chop it! 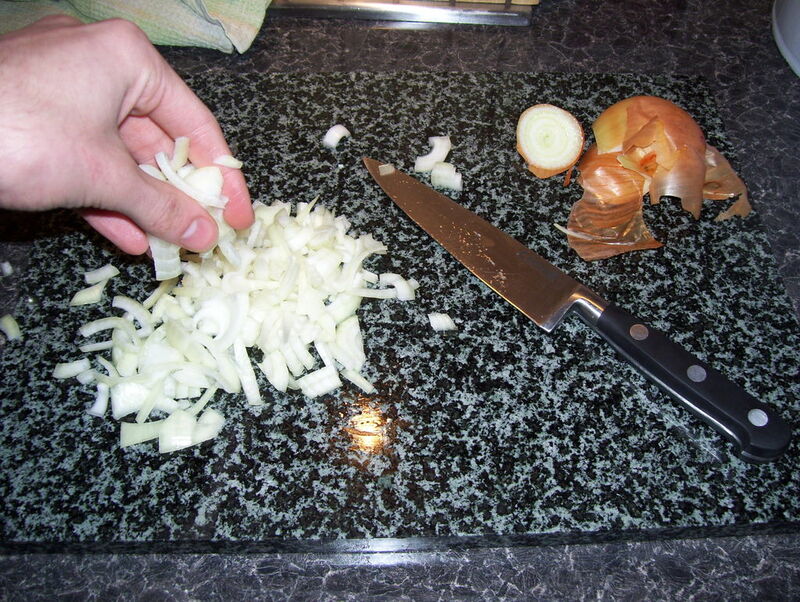 Well done, Now you have chopped them all we need to do now is just soften them in a pan with a little bit of oil. 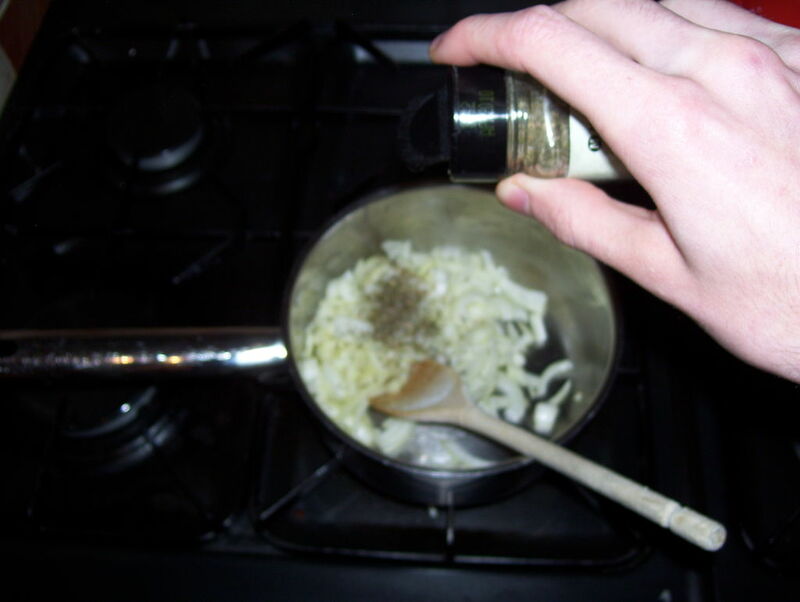 Remember to chuck in the mixed herbs with them. 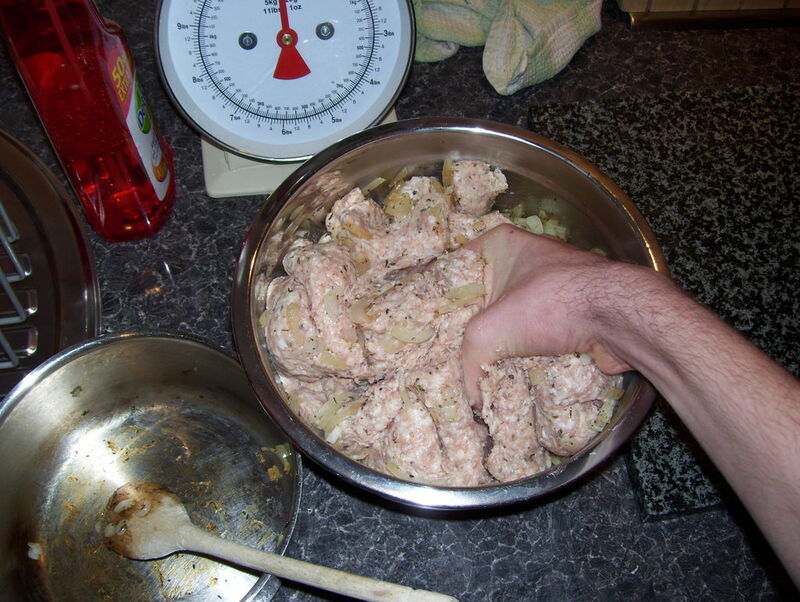 Don't worry, they are not fully cooked but they will be when the come out of the oven in the sausage rolls. Now just leave them aside cooling for a couple of minutes ready for the next step. The sausage meat from my butcher comes in little 450g bags and is top quality stuff. I have used four of these bags and I have scaled it down above if you want to make less. Try to use butchers meat as it's good for you (Much better meat) and good for your butcher (Keeps them in business). 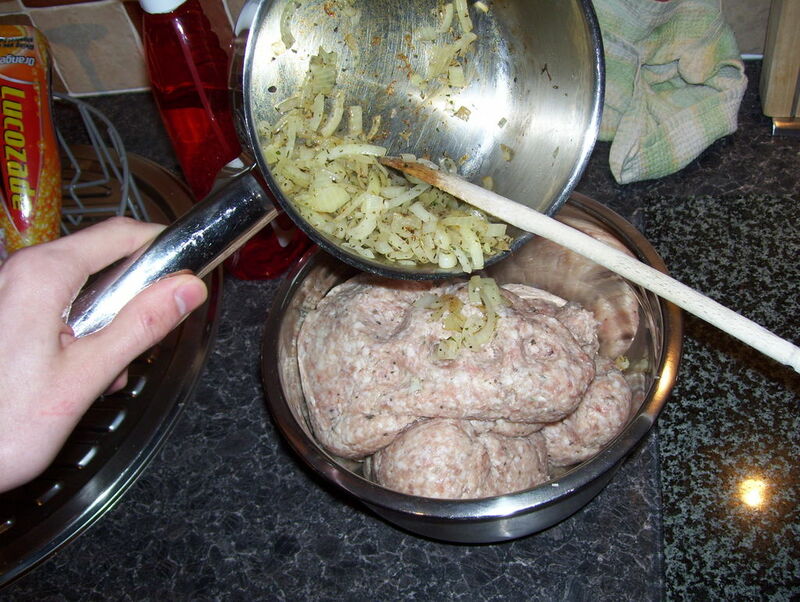 Now, tip all of your meat into the large bowl and chuck your onions from earlier in there, Give it a good mix about, You might as well use your hands as your gonna have to in the next step anyway! 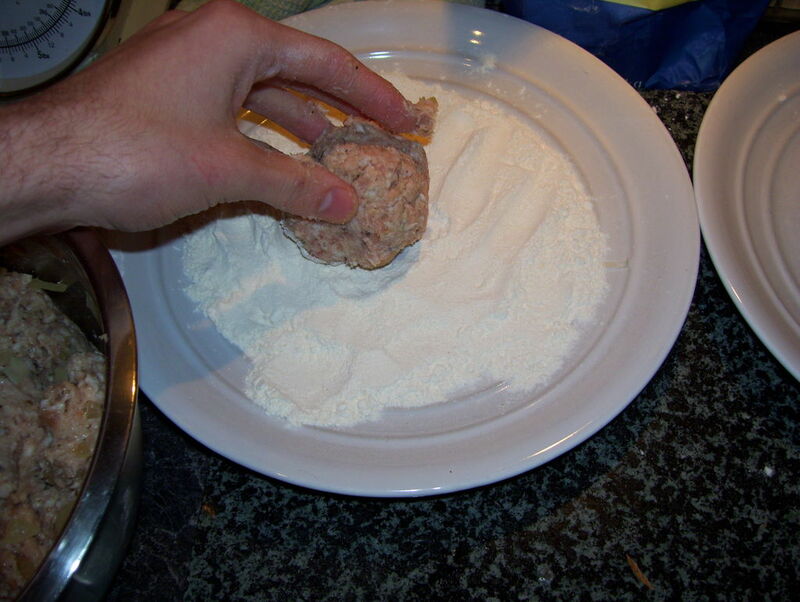 Making the meat into balls makes in much easier to handle and use in the next few steps. 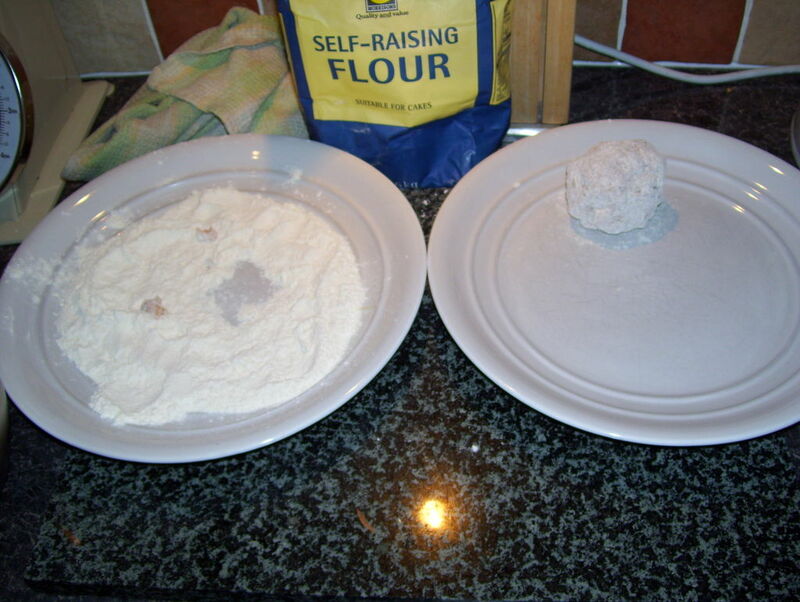 Have your two plates ready, Chuck some flour onto one of them, doesn't matter which type I just had lots of S.R so that's what I used. Grab a lump of the meat smaller than a tennis ball yet bigger than a ping pong ball, if that makes much sence. 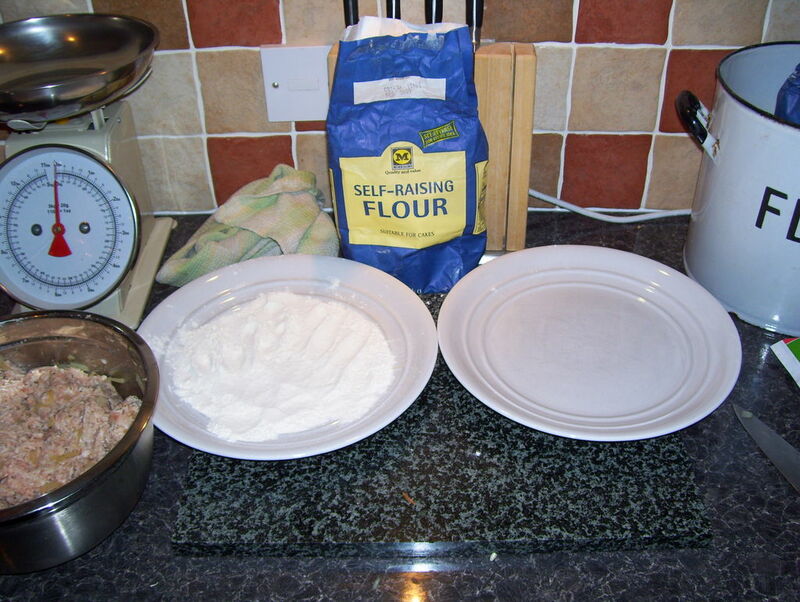 Round your balls and then chuck them on the floured plate and coat them, Tap them to get rid of the excess flour and put the ball on to the other clean plate. Repeat until you use all the sausage meat. Now move the finished balls aside and prepare the the next big mess. 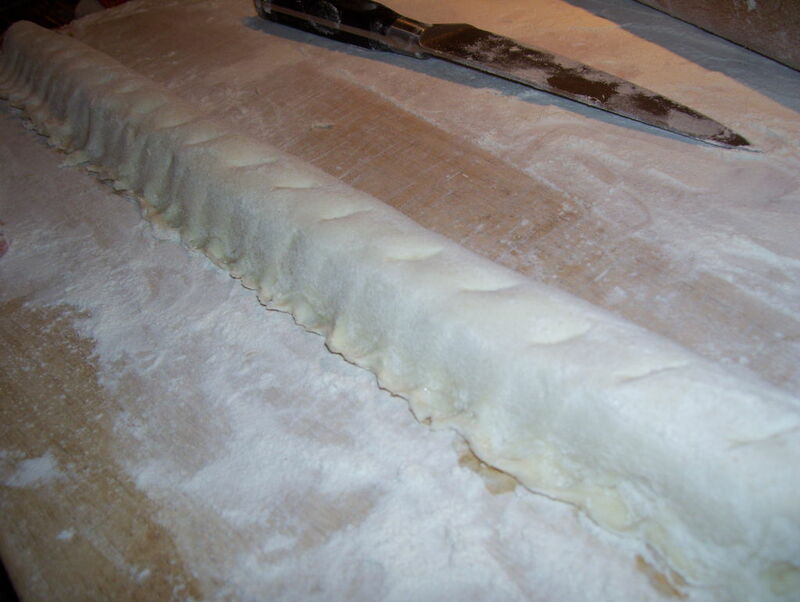 Pastry here comes in blocks chilled or frozen or ready rolled, we want to be using the blocks. 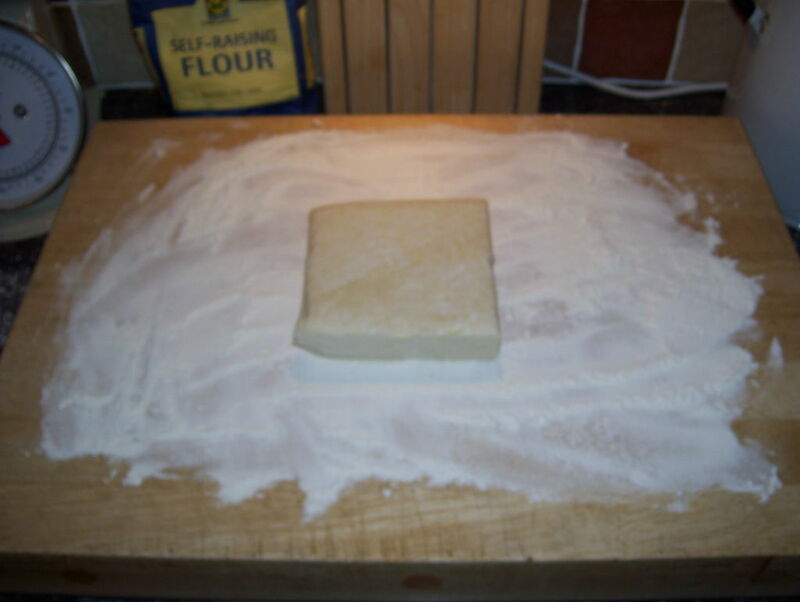 Remove all the wrapping, place onto a floured surface and cut the block into three. 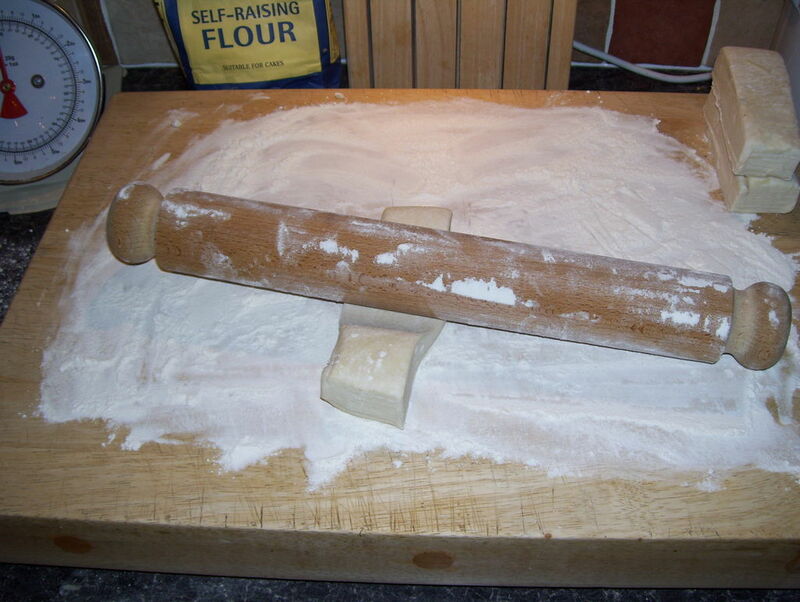 Take one of your blocks and place it down, using your rolling pin roll it along the longest side. Thats it nice and even, You might need to roll it a bit the other way too (A little bit!). You should end up with a long strip. 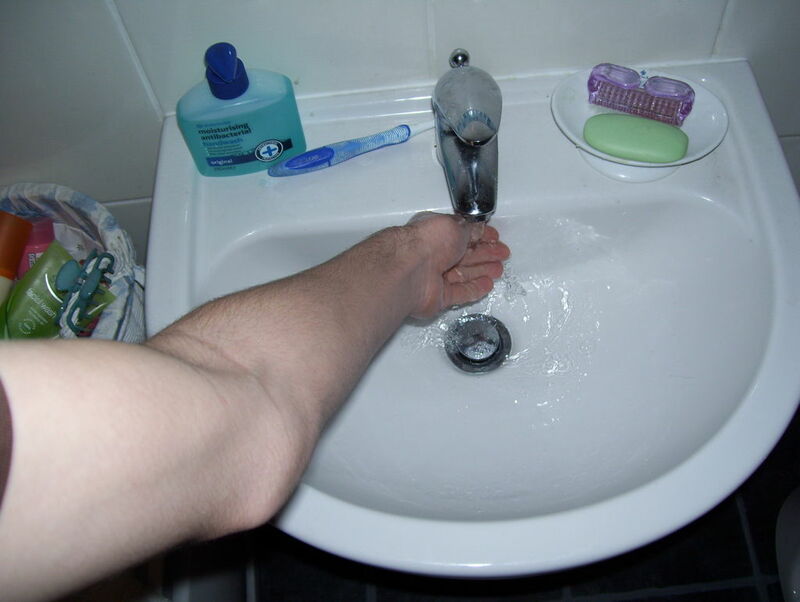 If yours looks anything like the pictures well done, Were almost there. Not long to go! 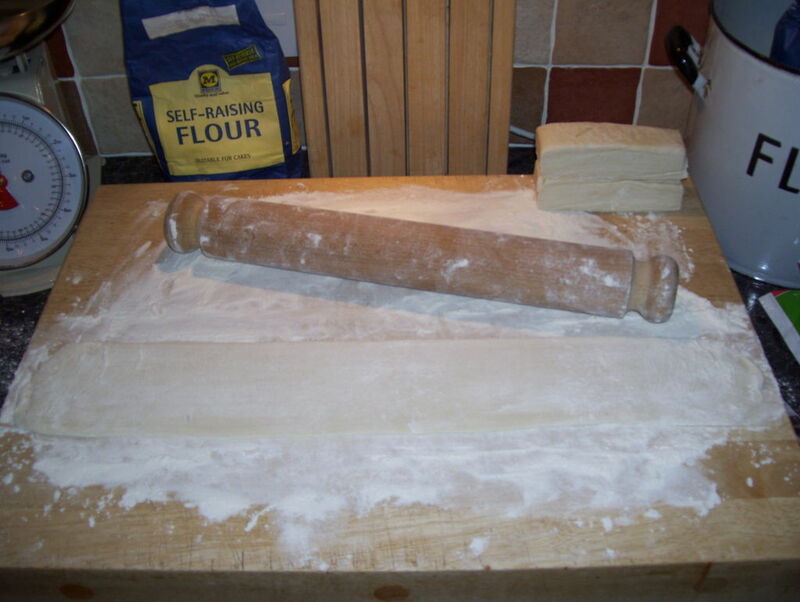 We have rolled out our pastry, now it needs some sausage. Lets see how. 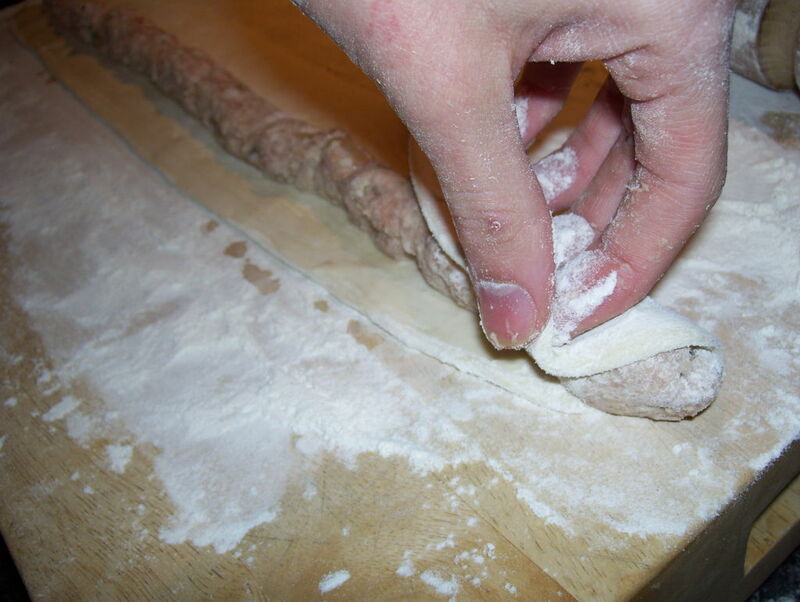 Just before this there is a variation you can try, Spread some cranberry sauce right along the rolled out pastry though the middle for that extra christmas-y touch, This is completely optional. 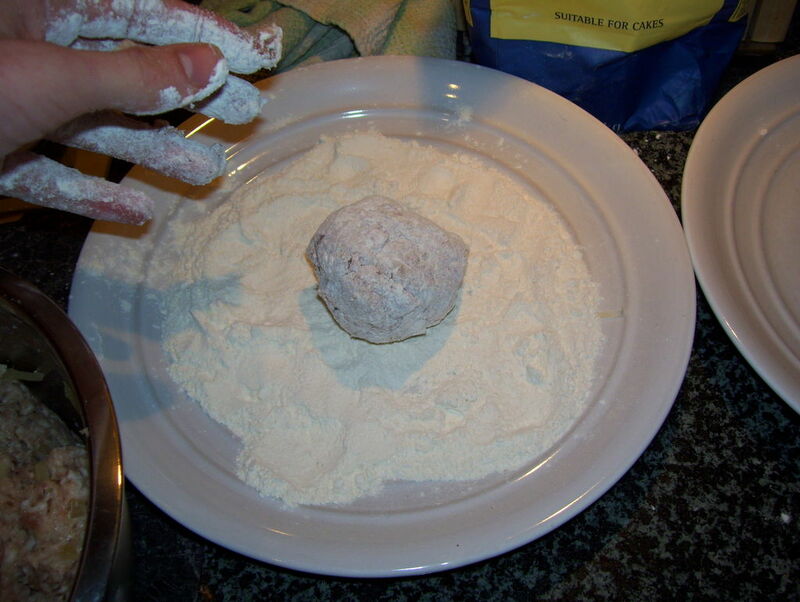 Take one of your balls from earlier, we now need to roll it into a sausage shape. You can do that by rolling or pulling it. 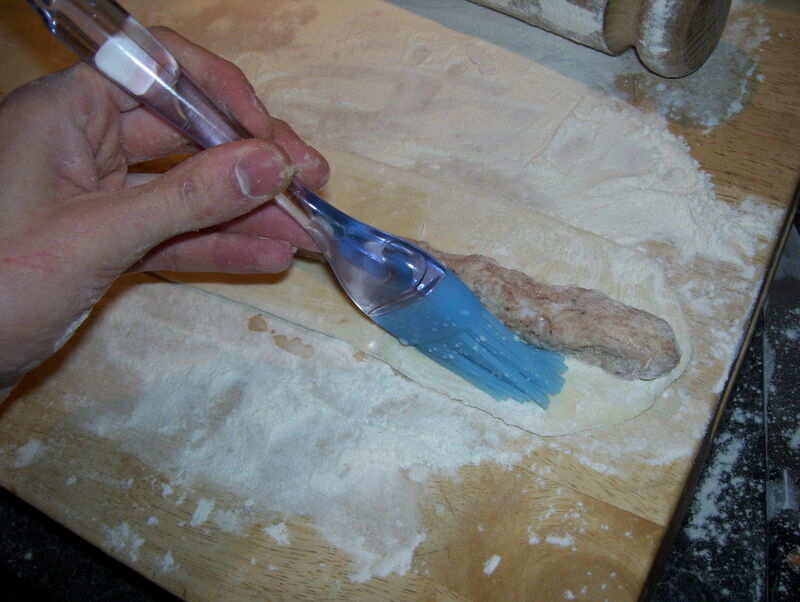 Just make sure it goes to each end and it isn't too thick. There we are, very close to the end. Not much left. 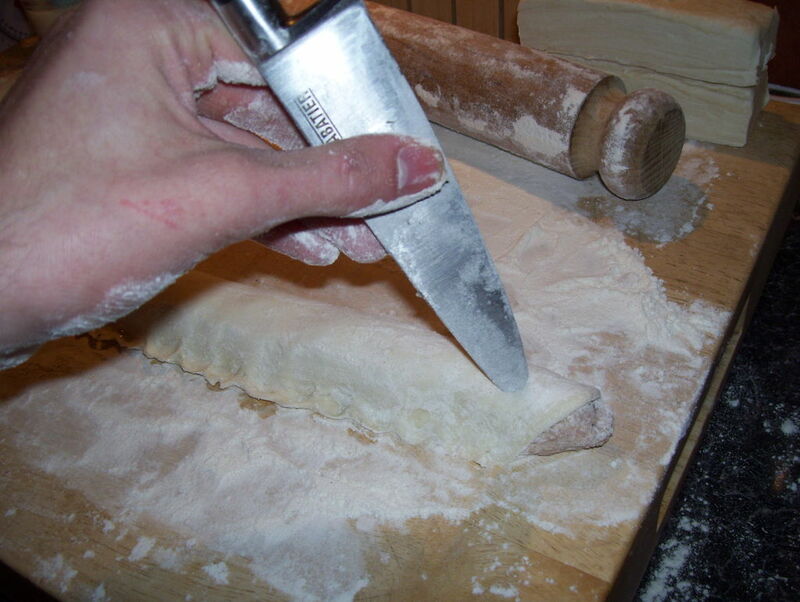 Before pulling over your pastry, brush some milk onto one side of the meat where the pastry is, all along. This will be the "glue". 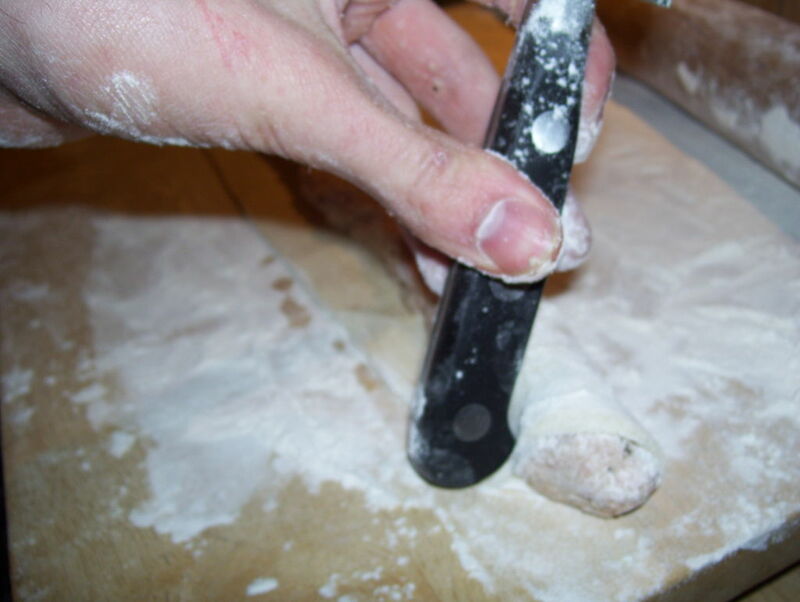 Now we can pull over the pastry and start using the bottom of the knife to close it and make it look nice. It's starting to look good isn't it! 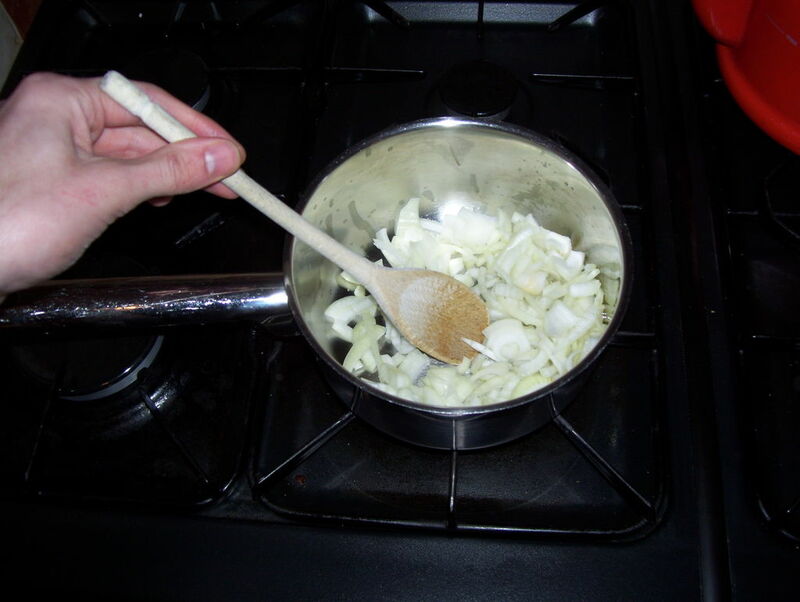 Stab along the top now using your knife, This helps them cook better and again looks nice. 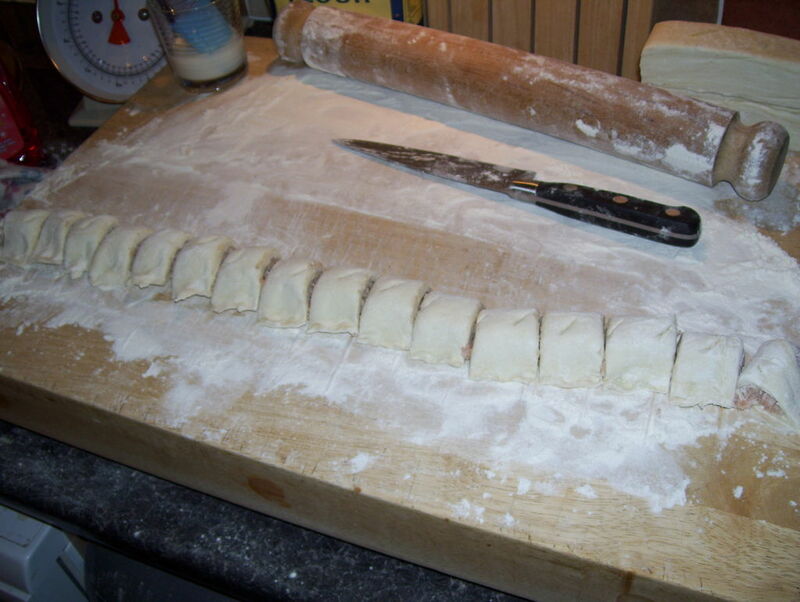 Brush the whole of your big sausage roll with milk, this will make it nice and shiny when cooked. 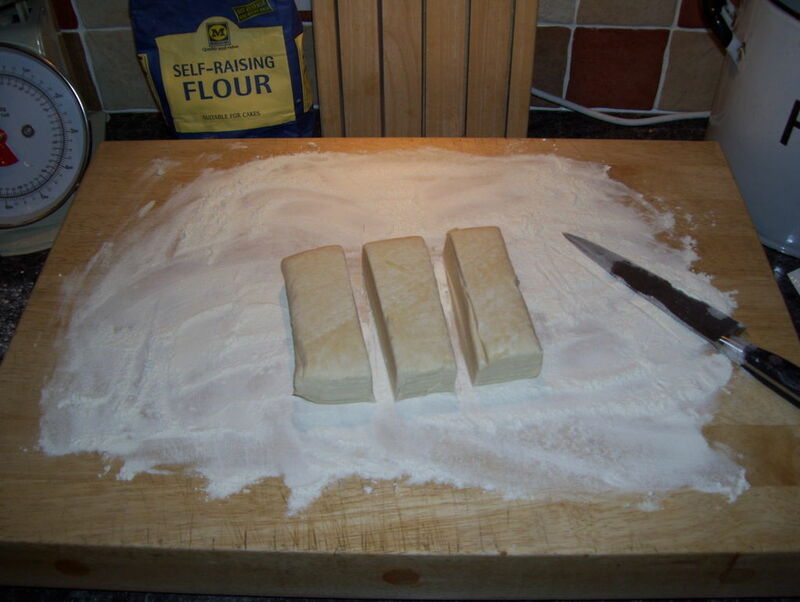 Now using the knife, cut your one big sausage roll in to many small ones! And now to bake them! 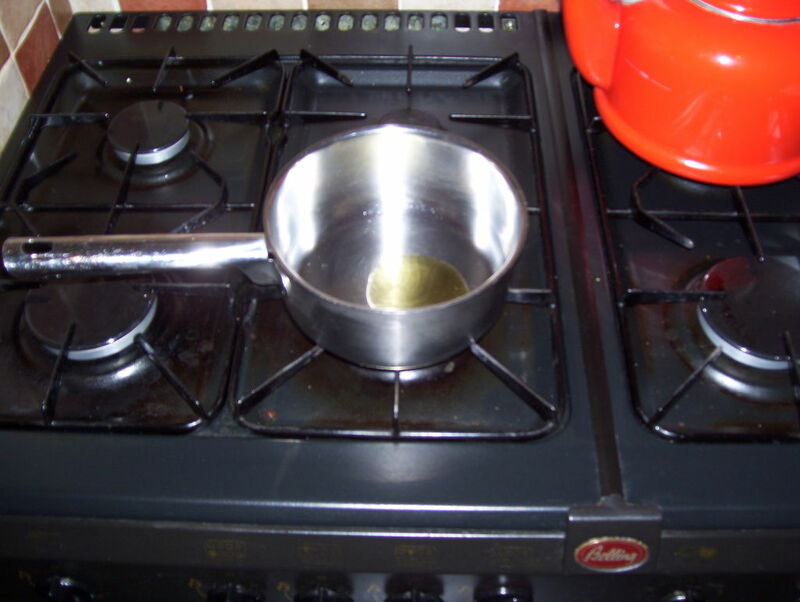 Step 12: Ready to Cook? 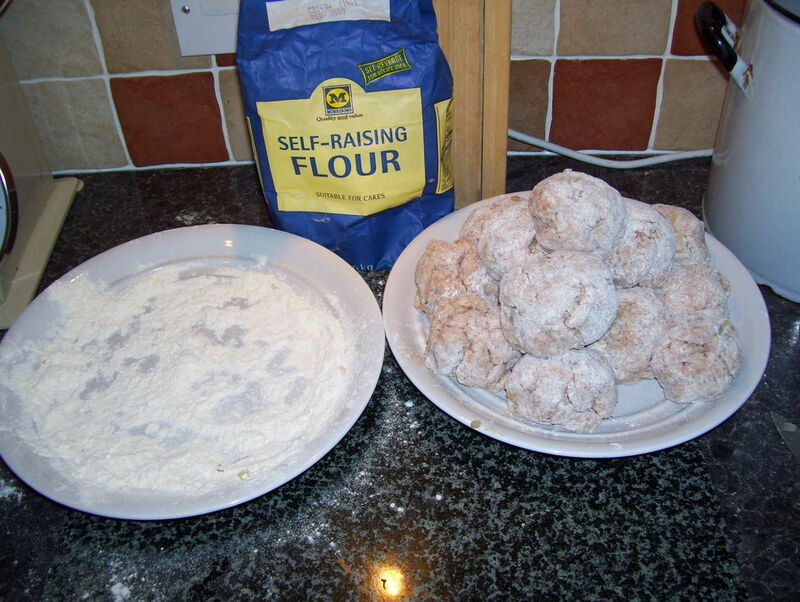 Right, now put them onto your oiled baking tray, leave them well spaced as they do grow in the oven. While there cooking you can clear up or be making the next batch if your making loads like me, yes do all that again! But, Ouch! Don't eat them yet. there haven't even come out of the oven. Best to do that before they burn! Remove them from the oven and place on the cooling rack. Eat when cool enough and enjoy! This is an example of what you could use these sausage rolls for, This brekfast may sound odd to you but please try it! Note: Picture to be added tomorrow. They do look yummy! Now I'm hungry for pigs in a blanket. Thanks! Fact: Over here in Britain we sometimes have sausages wrapped in bacon, that's what we call pigs in blankets. It's interesting to learn about things like that. And they were om nom nom nom! Beautiful, joem...wish I could have one!. Thanks Casey! They are very yummy, I had some last night while making them.